Following the death of Joseph Leask in 1862, two of his nephews, Thomas and Charles took over his shop at the bottom of Pitt Lane (now R W Bayes) and the part of the hotel immediately above. The ambitious brothers soon set their sights on the adjacent ruins of "Thomas Stout's house" and obtained the site for the purpose of building a hotel. The ground they purchased was actually, in earlier times, Kelday's Court and house. It was said to be the largest of all the courts in old Lerwick and was enclosed by a stone wall, with a gateway described as having stone vases on the side posts. The house, which resembled a country mansion, faced south, and a large garden stretched to the west of the Hillhead. A shop was in the gable facing Commercial Street. James's niece Elizabeth, John's daughter, later inherited the house and court. She married Andrew John Grierson of Quendale in 1755, and about 1800 Andrew Grierson, their son, built the Grierson town house at the foot of the neighbouring Quendale Lane (presently occupied by the Stage Door). The Kelday and Grierson properties thereby became closely linked. Indeed, prior to 1845, Quendale Lane was known as Grierson's Closs. The next owner of Kelday's House and Court was the above named Thomas Stout, who lived and had business premises at Stout's Court, South Commercial Street. In the 1860's the directors of the Commercial Bank were searching for a suitable location to build a new bank and they decided they had found it. Mr Stout's property on Commercial Street fitted the bill with it's frontage to the street and ample grounds stretching to the Hillhead, but all attempts to persuade him to sell fell on deaf ears. He said he had respectable tenants whom he had no wish to disturb and had no intention of selling. The directors next ploy was to suggest that the building was unsafe as the gables were discoloured, due to the extensive use of peats as fuel and the lack of vent linings; also the street gable was off the plumb. 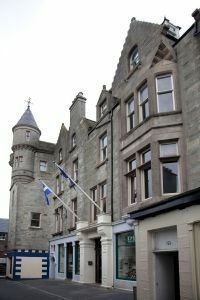 Lerwick Town Council was approached and after workmen reported on the condition of the house the tenants awoke one morning to find the property propped up with huge battens to prevent it supposedly collapsing on to the street. Mr Stout still refused to sell and ultimately the building was demolished by Court Order. By all accounts it was a difficult task, the walls were so thick, but it was found to have been well constructed and could have stood for a considerable time. Mr Stout was approached again and was offered better terms but still refused. Rather than sell he allowed the site to become derelict. He died in 1879 and the site remained in ruins until the Leask brothers acquired it from Mr Stout's representatives. Work began on building the hotel and the foundation stone was laid on 23 June 1886, with full Masonic honours. 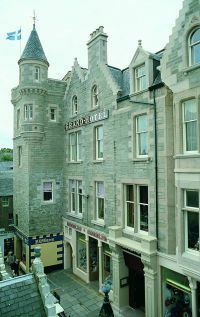 The contractor was John M Aitken, who was responsible for the building of many prominent buildings in Lerwick. The stone rope arch around the entrance to the cellar was carved by William Johnson, a Quarff man, who lived in Scalloway. He was a monumental sculptor to trade, but had a particular interest in scientific matters. He worked on some original theories and published a book, in 1901, called "The Law of Universal Balance: Discovery of the Motive Power in the Heavens: A new Philosophy for the New Century". His other stone projects include the carving above the Bank of Scotland, 24 Commercial Street, and the date above the door at Lyndhurst, Fort Road. A heart shaped beach stone bearing the inscription "between my mother's grave and mine" indicates the location of his grave in Quarff Kirkyard. The firm Joseph Leask & Co relocated, in July 1887, from 143 Commecial Street (no R W Bayes) to the newly created retail spaces below the hotel (now D E Shoes). The grocery provision and wines and spirits department opened at 145-147 Commecial Street with the drapery and clothing shop at 151, and the Grand Hotel was ready for business at 149 Commecial Street. A visitors list published in the Shetland Times, August 1887 reveals among the guests, "Sir Robert and Lady Sinclair of Murkle and party", "Dr Watson and party", "Mr and Mrs Bell, Lunna" and "Signo Paolo Della Forre, artiste peintre". 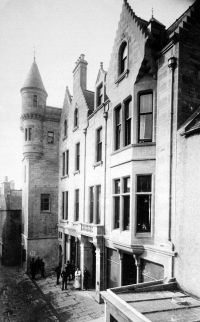 In October 1887, John Weber, hotel keeper, applied for transfer of the licence, previously granted to Thomas and Charles E Leask, for the Grand Hotel, 149 Commercial Street with side entrance at 1 Pitt Lane. However, an objection was submitted stating that the premises at 1 Pitt Lane was being used by Mr Weber as a Public House and bar-room distinct from the hotel and was therefore unlicenced. The entrance to the bar was situated near a very narrow flight of steps that posed a danger to the occupants who frequently left in a severe state of intoxication. In addition the noise and disruption caused by the patrons had resulted in the neighbours establishing a Vigilance Committee whose members took turn to watch the door of the bar. Eventually the licence was granted, based on a favourable report by the Burgh Surveyor regarding safe access to the establishment. In 1888 the Leask brothers were suffering financial difficulties, due to the intemperate behaviour of Charles, and an accountant took charge. David and George Goudie Kay, whose father and Joseph Leask were cousins, then took over the business of Joseph Leask & Co, in 1900, along with their brother Theodore, they bought the whole complex but, as their forte was retail, they did not wish to become involved in running a hotel. 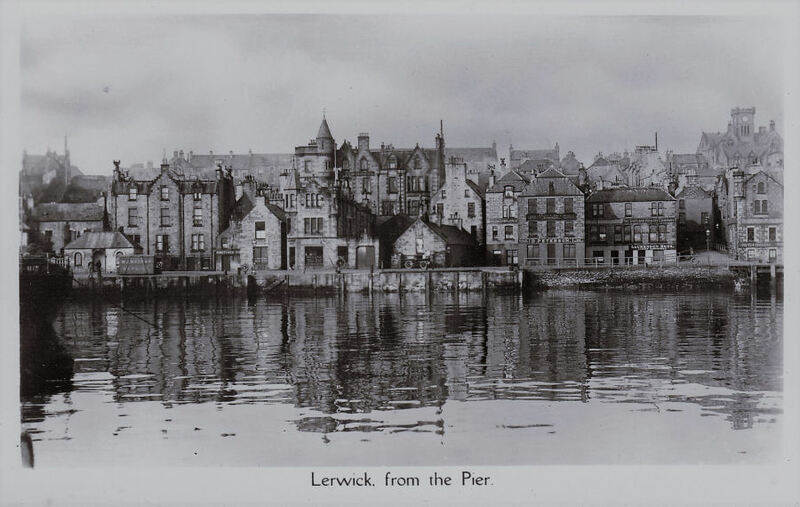 Consequentially over the next fifty years a series of managers were appointed, and bookings for accommodation could be made by telephoning Lerwick 18. Mrs Jemima Henry bought The Grand from the Kay family in 1950. The next owner was her daughter Irene Cheney and then James Berwick, Irene's second husband. In 1980 local businessman Charlie Fordyce became the proprieter and he had elaborate plans for the hotel, but these did not materialise. 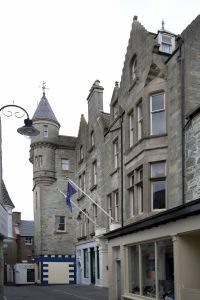 The hotel changed hands again in 1984 when it was bought by Mr and Mrs Neil Wilkins. The following year Posers Nightclub was opened. The Grand was taken over by the present owners JWG plc, in late 1993. Renovations were carried out in 1999.